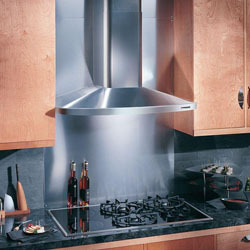 At Downtown Lumber Home Building Centre we believe that no kitchen is complete without the right choice of the perfect accessories. 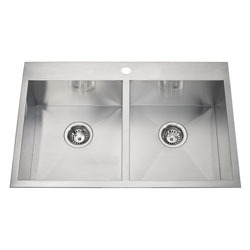 Therefore we have elected a wide selection of kitchen faucets, kitchen sinks and a variety of countertop materials. Whatever your dream kitchen choice would be, at our showroom you will be sure to find the right accessories that will certainly enhance your kitchen. 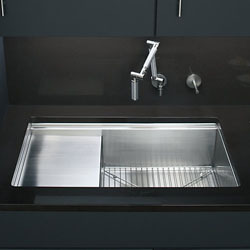 SINKS – A kitchen sink has to be versatile, practical and ergonomic, made of long-lasting materials and it should meet your needs and match your style. At Downtown Lumber Home Building Centre you will be able to find the world best known brands such as BLANCO, KINDRED, KOHLER, among others. 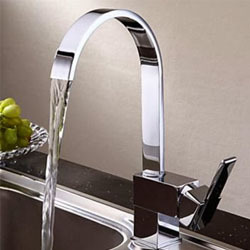 FAUCETS – All our faucets are built to last with solid brass construction. They feature ceramic cartridge technology for easy maintenance and replacement, and for precise regulation of water flow and temperature. 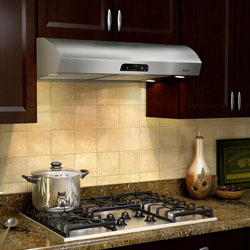 Ergonomically designed, pull-down and pull-out hand sprays offer an aerated flow for washing and rinsing. 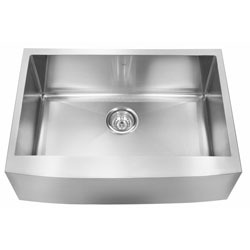 Some of the models we carry also offer a wide vegetable spray for washing vegetables and delicate fruits or rinsing the sink. 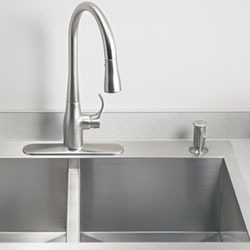 As an option, solid spout faucets can be matched with side sprays for easy cleanup. 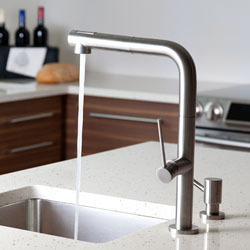 Give your kitchen a fresh new look with our range of single lever kitchen faucets and two handle kitchen faucets. Enthusiastic cooks will love our mix of exciting designs and practical features. 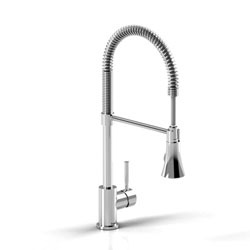 At Downtown Lumber Home Building Centre you will have a wide variety of choices, all from reputable brands like BLANCO, RIOBEL, GROHE, KWC, CABANO, MOEN, among others. 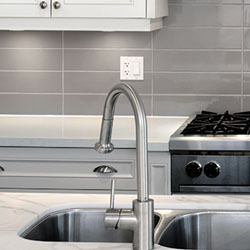 COUNTERTOPS – Choose the best countertop surface to suit your budget by considering each option’s looks, durability, maintenance requirements, and cost. Cabinetry may dominate your kitchen dreams visually (as well as financially), but your countertops will bear the brunt of day-to-day kitchen activity. Whether it’s for fine cooking, crafting casual meals, doing homework, or paying bills, countertops are the hardworking surfaces beneath it all. Choosing the right materials for your kitchen means comparing costs, appearance, ease of installation, durability, maintenance, and the possibilities for repair. 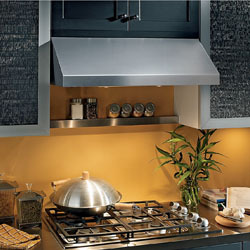 Kitchen countertop offerings are a mix of old standbys and new technologies. Laminate, ceramic tile, and natural stone continue to be popular, but solid-surfacing — synthetics that mimic or even improve upon real stone — is expanding its role with the addition of new materials, colors, and textures. 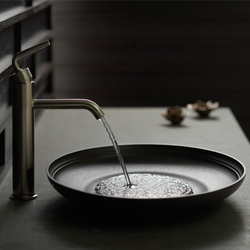 Meanwhile, surfaces with more specialized appeal and applications, such as concrete, butcher block, and stainless steel, are gaining popularity. 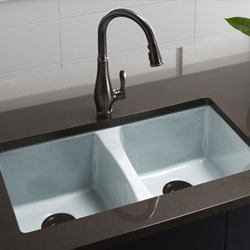 No matter what’s more important to you in planning your kitchen there’s a countertop surface that fits your needs. 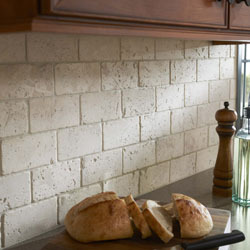 BACKSPLASH – The Backsplash is considered the jewel of the kitchen. 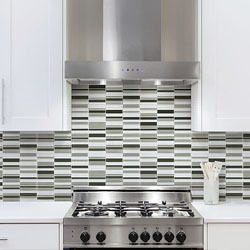 A distinctive tile backsplash has the ability to create a focal point in your kitchen or wet bar and really dress-up or jazz up your decor for a personal look. 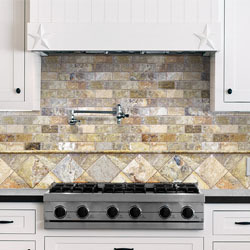 The area that a backsplash covers is really not so large, so your expense is small compared to the visual impact you achieve. 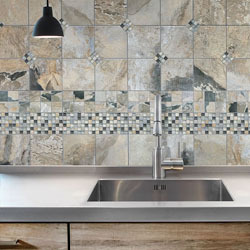 Most kitchens look so very similar, and all kitchens that are really used get their share of splatters and drips, so a ceramic tile, mosaic glass tile, stainless steel or creative metal backsplash makes good sense too. 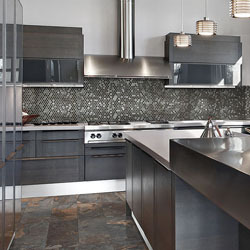 At Downtown Lumber Home Building Centre you can get some great ideas for designing a backsplash. 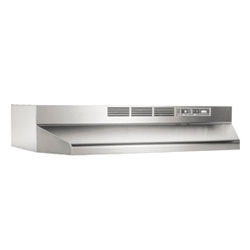 KITCHEN FANS AND RANGE HOODS – At Downtown Lumber Home Building Centre we have a wide variety of range hoods from the well known North American brand Broan-Nutone, leader in residential ventilation products such as range hoods, ventilation fans and indoor air quality products. 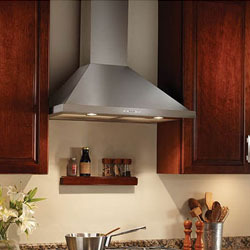 At Downtown Lumber Home Building Centre, you will not only find your dream kitchen, but we can also install it for you.